As support for marijuana grows to an overwhelming majority, the question of national legalization is straying away from a matter of "if" and inching closer towards a matter of "when." Up until this point, California's cannabis industry has been completely unregulated at the state level, but regulation is coming with California's Medical Marijuana Regulation and Safety Act, or MMRSA for short. This means that now is the time for venture capitalists to swoop in with investment, because once the MMRSA is implemented, growth in the industry may stagger under the weight of government oversight. The looming threat explains why weed-incorporated consumables are popping up on the market each day. 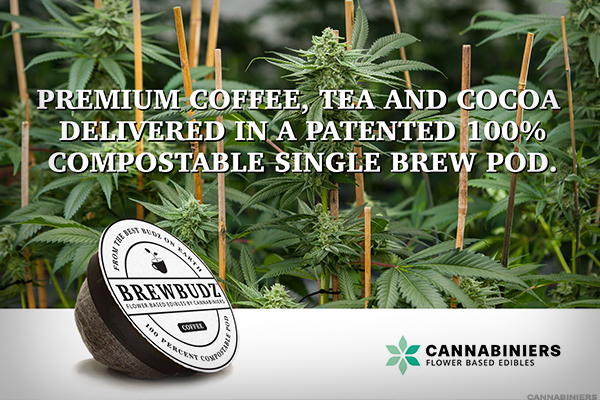 Cue Cannabinier's newest product, Brewbudz, a marijuana infused coffee pod line. Think coffee, but without the jitters. "Cue Cannabinier's newest product, Brewbudz, a marijuana infused line of single serve coffee pods." The pods are compatible with all K-Cup and K-Cup 2.0 style brewers and are 100% compostable, an aspect that resonates well with an eco-friendly market according to Timothy Walters, president and COO of Cannabiniers. "The cannabis consumer tends to be eco-conscious," said Walters. "Youth today are very disenchanted with the K-cup concept, people don't like using them [because] they recognize that it's environmentally disastrous, but there's so many easy benefits to preparing a good cup of single-serve coffee. Marrying those two up and having an eco conscious solution that's natural and not a sugary drink is a healthy alternative and we think the market recognizes that." Editors' pick: Originally published July 14. Each pod retails for $7 for all THC levels: a 10mg BrewBudz pod retails at the same price as its 25mg and 50mg counterparts. Derek Peterson, CEO and founder of the first U.S. publicly traded cannabis company Terra Tech (TRTC , shares Walter's sentiment. "The cannabis industry is becoming more environmentally conscious as the importance of using sustainable practices becomes more widespread across all sectors," said Peterson. Cannabiniers is a food technology and brand management company, with a portfolio encapsulating cannabis infused products. With 9-12% of beverages composing the edibles sphere, Brewbudz appears to be filling a space within marijuana markets. "It's a great way to formulate a controlled dose into a convenient package and has the potential to further enhance the experience by integrating it into our coffee and tea time," said Anthony Smith, chief science officer of Signal Bay Inc.'s (SGBY Evio Labs, the leading cannabis lab testing company in the United States. However, on a technical level, Smith claims that these products are not necessarily straightforward with their ingredient offerings. "Unique processes and additives like emulsifiers may be required to formulate these products because cannabinoids and terpenes have very low solubility in water-- typically less than a milligram per milliliter," he said. "So, pay close attention to the details in the processes and ingredients used to standardize cannabinoid dose in your favorite infused coffee or tea product." In fact, this is a common problem seen across the edibles sphere. Using chemical components like butane and carbon dioxide is common practice, but when consumed regularly, can result in adverse health effects for users. "Today, the way edible products are manufactured, they use an extraction process with butane and carbon dioxide which is very unhealthy because they're introducing [those chemicals] into the product and evaporating that," said Walters. "So, sophisticated users see that, and like the flour whole plant approach where our extraction process is using the flour in its natural state. 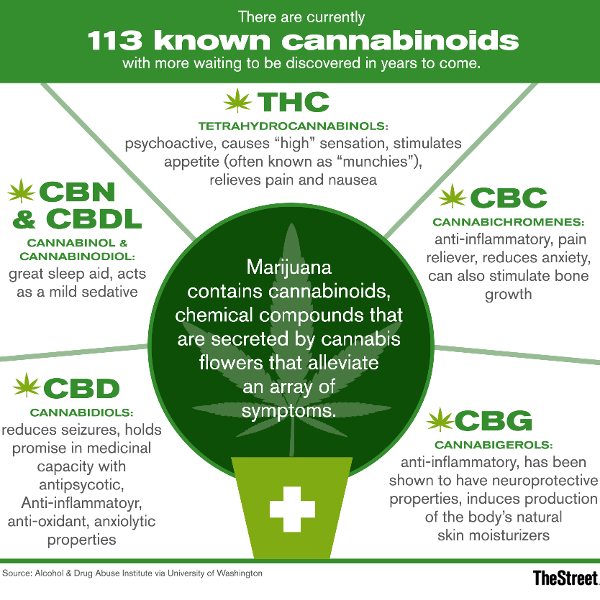 Our product is using the whole profile of the flower, which includes the terpenes, the CBDs, as well as the THC." For 2017 sales, Walters predicts the brand will harvest $2 million worth of revenue in the Nevada market alone. From there, Brewbudz will begin to feather into Colorado, California, Washington, and Oregon. As those markets mature, Walter believes the gross revenue will move to $30 million over the next two years. "The challenge for us is to keep our visibility high in stores," said Walters. "For example, we're currently in 35 in the 52 stores in Nevada, which is a manageable number of stores to keep your product on the shelf. When you go to Colorado, there's close to 500 stores. And when you move to California, you have more like 3,000..., so keeping our product front and center is going to be critical [for continued success]." As the public becomes increasingly receptive towards weed, other competing industries are growing tense. And that's not just limited to tobacco, but also with alcohol and pharma. Walters notes that the alcohol industry has felt the heat from the devil's lettuce, citing a 20% drop in Colorado booze sales year-over-year. Jeffery Zucker, president of Green Lion Partners (a Denver-based firm focused on early stage development among cannabis firms), agrees, saying that national legalization of cannabis is likely to have a tremendous impact on the pharmaceutical, alcohol, and tobacco industries. "In fact, the effects are already apparent: opioid prescriptions and deaths are down significantly in medical cannabis states that allow for treatment of chronic pain," said Zucker. "Beer sales in Colorado, Oregon, and Washington have taken a noticeable downturn since full adult use has been legalized, as consumers have healthier alternatives for enhancing their social experiences." With tobacco already in decline, consumer trends are leaning towards people swapping out cannabis usage for a beer or glass of wine. Based on these trends, cannabis may not impact big tobacco, but Big Pharma and the alcohol industry should be weary. When asked about concerns surrounding the alcohol industry following the national legalization of marijuana, Constellation Brands (STZ - Get Report) , the ones who manufacture the popular brand Svedka, declined to comment. Molson Coors Brewing Co. (TAP - Get Report) referred TheStreet to a statement expressing skepticism about the legalization of marijuana. But according to Bethany Gomez, Director of Research for Brightfield Group, tobacco big-wig's shouldn't fret because "tobacco usage and cannabis usage are not substitutes." If anything, the ever-declining tobacco industry may make its own stake in legalized marijuana. With their factory capabilities, tobacco giants Philip Morris International Inc. (PM - Get Report) and Reynolds American, Inc. (RAI are likely to seize market-moving opportunities thanks to their industrial production capabilities. "A lot of people in the industry are worried about Philip Morris coming in and producing pre-roll's," said Gomez. "If Philip Morris were given the opportunity to enter, they have the operational expertise to operate very well in the space. Every grower is worried about that." Concerns also stem from the profit margins in the industry. Despite top-line growth and top-line sales, it's important to recognize that revenue doesn't equate into profit. Because of the high costs of cannabis along with other deterrents manufacturers face, profit margins are thinner than the revenue growth would suggest. "If you're going to invest in dispensaries, you have to be cautious about it and be focused on the long-game," said Gomez. "The profit margins aren't there yet, but if they are there, [then] the future will heavily depend on the regulatory environment."